Are you an expressive communicator in English? Then, obtaining a Canadian Permanent Residency is no more a hassle for you, since language proficiency is one of the most important factors for Canada Immigration. Canada is a place of interest for many professionals. It is the most immigrant-friendly country providing a range of opportunities. Also, the country’s Express Entry System is the best electronic platform, which provides Invitation to Apply (ITA) for Canadian Permanent Residency. For receiving a faster ITA, candidates should hold a good Comprehensive Ranking System (CRS) Score. These scores is analyzed on various core human factors. And, among the most, the score or the grade received in IELTS for language proficiency plays a key role for candidate’s faster immigration. What is the IELTS and how does it qualify a candidate? The International English Language Testing System is commonly known as the IELTS. It is a popular English language test introduced in 1989. Canada opt this examination for testing the language skills of their skilled immigrants. Every year plenty of people choose IELTS for improving their chances for Canada Permanent Residency. The score or grades obtained in these areas are calculated in CLB, i.e. Canadian Language Benchmark. For a successful Canada Immigration, the candidates have to score a minimum CLB 6 for eligibility. Also, the candidates who gain a score below this band are not considered as qualified for Canada Immigration. Hence, it is mandatory for candidates aiming Canada immigration to qualify in all key areas with an overall score above CLB 6. How to Process for an IELTS Exam? Select the date for your examination and complete the online application form by providing the accurate information. Then pay the online payment through the credit card/debit card or any and take a copy of the statements for future use. Need of downloading the application form of IELTS. Fill the form with appropriate information, and also select the date for examination. The payment of the examination can be done through demand draft or cash. The Candidates receiving the best band score in IELTS test have the most chances of having good Comprehensive Ranking System (CRS) Score. Likewise, the higher the Comprehensive Ranking System Score, the higher chances to avail an Invitation to Apply (ITA) for Permanent Residency. Therefore, candidates aiming for Canada Immigration need to score a good grade in IELTS Test. Also, it is mandatory to clear the IELTS test in order to lodge an application in Express Entry. Since, the immigration and IELTS are much linked to each other, it is better to opt for an immigration agent for a clear understanding. 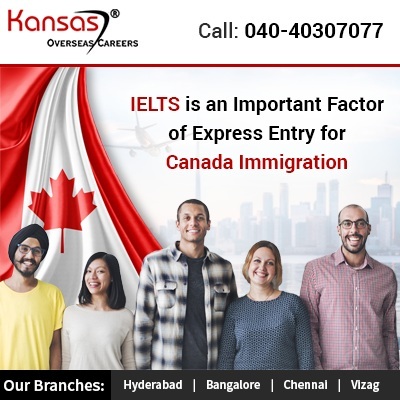 if you are Searching Canada Visa Consultant in Hyderabad, check out Kansas Overseas Career for experiencing the best Canada immigration assistance. For a quick query, call @ 040-40307077 or drop a message at info@kansasxpress.com.